My parents are visiting from Istanbul and they brought me a wonderful guvec pot, the traditional earthenware pot, that is used for cooking chicken, meat or vegetable based dishes. This is slow cooking at its best; the flavors of the seasonal produce and choice of meat mingle and simmer over 2 hours and the earthenware guvec pot brings out its distinctive flavor. At the end of the cooking you get a delicious, melt-in- the mouth, tender stew of vegetables and meat, so worth the wait. A little history for guvec, excerpted from “The Oxford Companion to Food” by Alan Davidson, kindly shared by My Traveling Joys; “Gyuvech is the Bulgarian name for a kind of earthenware casserole or the dish cooked in it. The name comes from the Turkish word güveç, which has the same meaning. The casserole is fairly shallow with a large surface area allowing for maximum evaporation. It comes round or oval. These vessels are found all over the Balkans are used for cooking almost anything of a savory nature, including fish as well as meat, poultry, and game dishes.” In Rural Anatolia, the guvec pots can be sealed and buried in the ashes of the fire to cook slowly overnight. It is also common for the locals in Anatolia to take their guvec pot to be baked at the bakery. Layer the vegetables that need longer cooking period towards the bottom of the guvec pot. This guvec is a wonderful way to use up any seasonal vegetable you have and the meat of your choice if you like. I used runner beans, eggplant, potatoes, zucchini, onions and peppers, they worked really well. When the tomatoes are in season, you can replace the chopped canned tomatoes with the fresh ones; the flavors will be even more amazing. When cooking in the clay pot, bear in mind to layer the vegetables that need longer cooking period towards the bottom of the pot. Once cooked, turn the heat off and let the Guvec rest in the earthenware pot for 30 minutes. The flavors blend and settle deliciously and the earthenware pot will keep warm for a long time. You may also use the cooked potatoes in this guvec pot to make this delicious Patatesli, bulgur kofte; potato and bulgur patties We love dipping these rolls into the delicious juices of the guvec. I love the all in one pot casseroles and “tencere yemekleri” in Turkish cuisine; they are wholesome, easy and healthy meals and great for entertaining and many options included at my Ozlem’s Turkish Table cookery book, signed copies available to order at this link. I hope you enjoy this delicious, tender and healthy guvec It is a bountiful dish and a great crowd pleaser, the leftovers also freeze well. If you don’t have a clay / earthenware pot, a cast iron casserole dish, a heavy ramekin dish or a heavy based pot like Le Creuset would work too. For a vegetarian version, simply omit the meat. Mushrooms would work really well here instead of meat. I hope you enjoy this delicious, tender and healthy Tavuk Guvec, slowly cooked in a traditional earthenware guvec pot. It is a bountiful dish and a great crowd pleaser, the leftovers also freeze well. If you don’t have a clay / earthenware pot, a cast iron casserole dish, a heavy ramekin dish or a heavy based pot like Le Creuset would work too. For a vegetarian version, simply omit the meat. Mushrooms would work really well here instead of meat for a vegetarian version. Spread the eggplant slices over a tray and sprinkle salt over them. After 15 minutes, dry the eggplants with paper towel to get rid of its bitter juices. Heat the olive oil in the pot and stir in chicken pieces and onion. Season with salt and freshly ground pepper and sauté over medium heat for 5 minutes. Add the tomato paste and red pepper paste and sauté for another 3 minutes. Now, start layering the vegetables, bearing in mind to layer the vegetables that need longer cooking period towards the bottom of the pan. Layer the potato slices over the chicken, then the runner beans. Next layer the bell peppers, courgettes and aubergine. Stir in the chopped tomatoes and water. Season with salt and freshly ground pepper, as well as red pepper flakes if you like more heat. Do not stir the guvec pot; cover and start cooking at medium heat, until it starts to bubble. Once bubbling, turn the heat to low and simmer and gently cook for 2 hours, covered. Once cooked, turn the heat off and let the Guvec rest in the earthenware pot for 30 minutes. The flavors blend and settle deliciously. Check the seasoning and add more salt and ground black pepper if needed. You can serve Tavuk guvec with these flavorful potato & bulgur patties and a dollop of plain yoghurt aside. 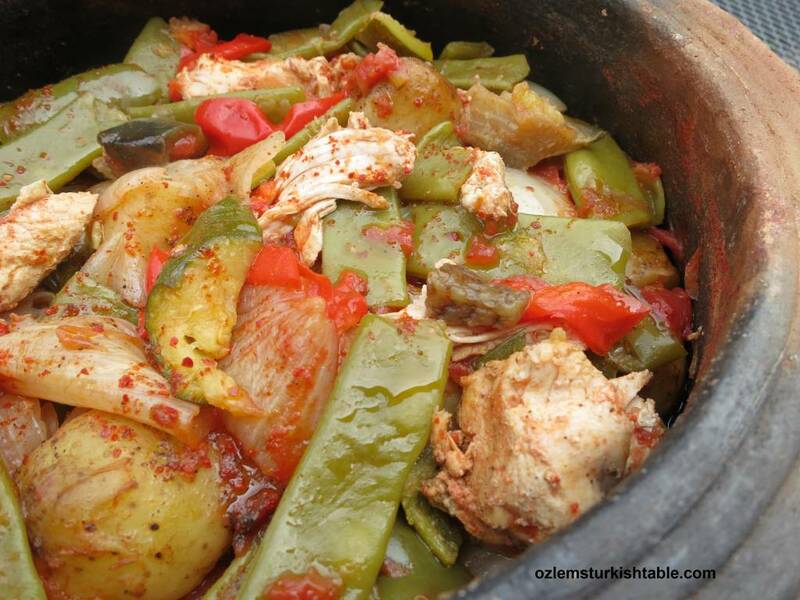 Earthenware pots give amazing flavor to food:) love those, Ozlem, and this stew looks and surely tastes perfect! XxPeri. J does the same thing in winter – guveç tucked into the side of the open fire for a few hours. The end result is always worth the wait – delicious! 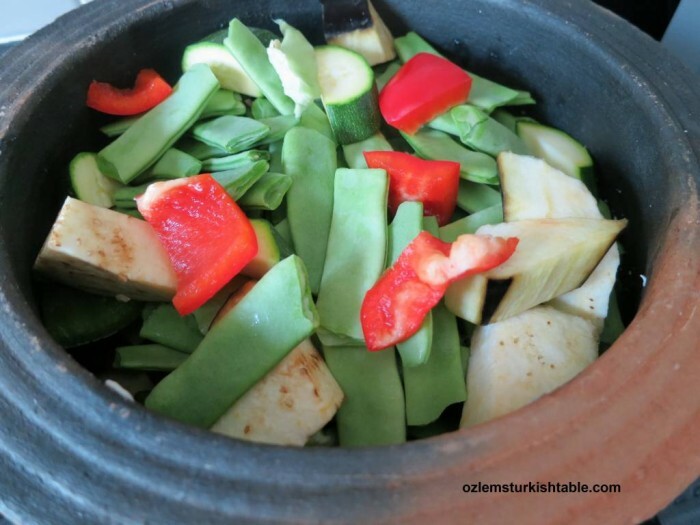 Özlem’ciğim, We love güveç and this recipe sounds particularly delicious with all of its summer vegetables. I’ve been really cranking out some of your recipes while out here on the island. Last night, it was your dried eggplant stuffed with delicious spicy meat and rice. Yum! BTW, our internet has really been on the fritz lately. Don’t know what it was, but I haven’t been able to reach your blog at times. Happily, I have your recipes saved in a file on our desktop. Cheers. Öpüyorum çok. I love this kind of slow cooking – it’s so satisfying. Many years ago I was told off for washing up a similar sort of pot too thoroughly. The cook told me that I was washing away the flavour of the next dish. I’m sure she was right. I have made your patties before and they are certainly delicious. Many thanks Phil, I agree with you, it really is a satisfying dish – loved your “washing away the flavors of the next dish!”:) delighted that you enjoyed the patties, thank you for letting me know. 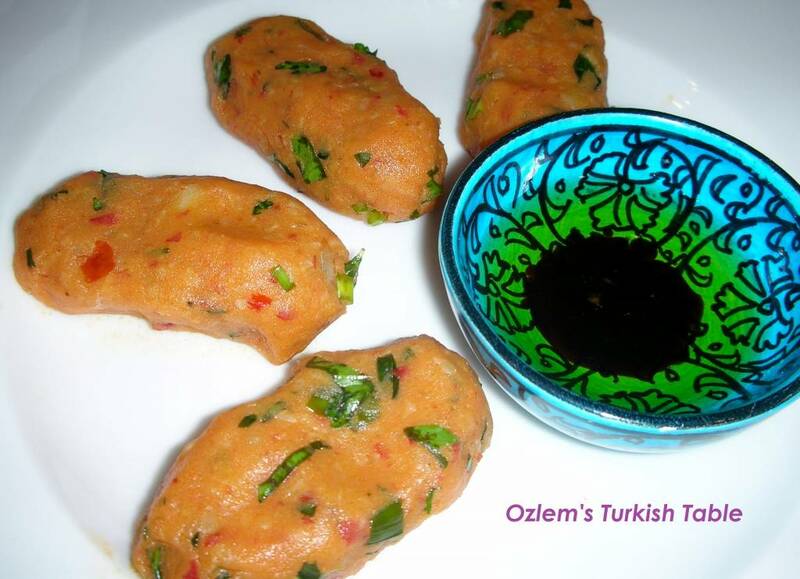 Thank you for this marvelous recipe, Ozlem. Already made it 3 times now, lol; we love it. Çok güzel. Delighted to hear you enjoyed it Carl, Afiyet Olsun! 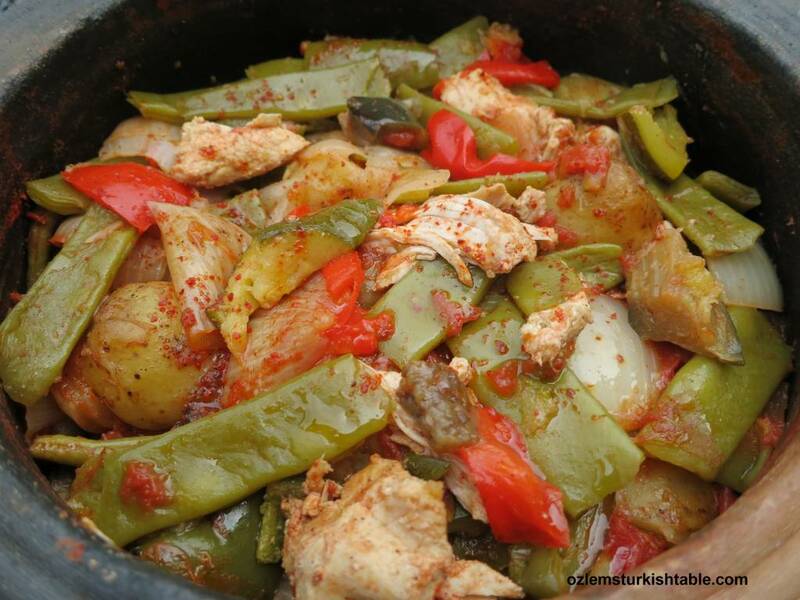 I want to cook a Turkish chicken dish to take to a big family gathering. Would this recipe be suitable for cooking in advance, cooling, and then re-heating 24 hrs later? If not, are you able to recommend another recipe that I could do this with? (my sister’s cooking lamb, so it would be better if I did chicken, I think, for variety). 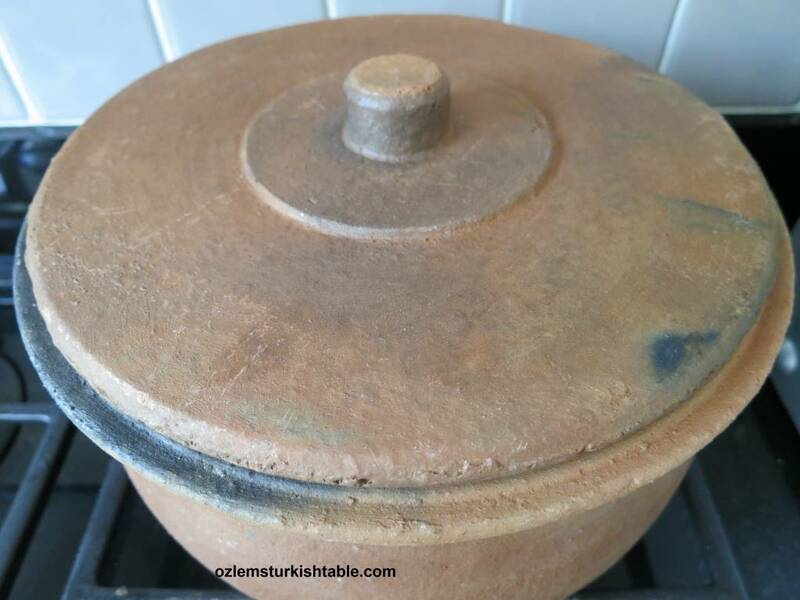 Dear Oezlem, I live in Istanbul and so I am able to buy a earthenware pot. But I don’t know, how to prepare the pot before the first use. I generally put the pot in the oven is this correct?